﻿Balancing priorities in business is difficult. How soon will you have 10 more clients, 10 more minutes a day, 10% more sales, 10 big steps forward? 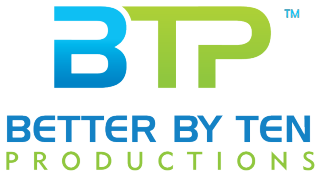 Better by Ten Productions offers marketing consulting support services which empowers your team to create forward motion. Use our services and systems to evaluate, plan, and measure success. You will find it difficult to find a team which responds faster or more committed.